The original words for this Les Barker poem fitted the music I composed perfectly, so I didn’t have to modify them at all. I got the poem from someone at the Ruskin House Folk and Blues club, who told me that Les Barker was a comedic performer on the folk club circuit performing mainly unaccompanied narrative send-ups of famous songs such as ‘Go Now’ by the ‘Moody Blues’, which he renames ‘Gonads’. 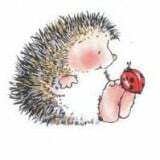 The Poem ‘Nobody Hugs a Hedgehog’ was, I believe, one of Les Barker’s own compositions. I recall now that it was given to me in a little printed booklet also containing his various satirical spoofs. Where it’s got to, I’ve no idea, which is disappointing as I’d like to look them all up, now I think of it.